Fun for the whole family at Just Beachy, Union Pier. This beautiful cottage is located in the heart of Union Pier a few blocks from the beach and just blocks from Union Pier Market and Red Arrow Roadhouse. This newly appointed home features 3 bedrooms, 2 bathrooms, a large kitchen, screened porch and fire pit. As you enter the front door you immediately feel relaxed as the beachy decor takes you to another place. The living room has a large sectional with a TV and fireplace. There is plenty of space for watching a movie or just hanging out and relaxing. This home has cable and WIFI for guests to enjoy. Off the living room are three bedrooms and a bathroom. The master bedroom has a king bed and master bath attached. The master bathroom features a walk in shower plus large jetted soaker tub. The master also has access to the screened in porch. The second bedroom has a queen bed and the third bedroom has two twin bunk beds. The main bath is large with a walk in shower. The kitchen is large enough for two chefs and there is a large dining table that seats 8 guests. Off the kitchen is access to the screened porch which features a seating area to enjoy the outside without the bugs. Outside is a large side yard plus an area near the screened in porch that has a fire pit and picnic tables. The beach is just a few blocks from the house and is great for spending the day swimming and sunning or watching the sunsets. The house is located close enough to downtown Union Pier where there is an ice cream shop, bakery, convenient store, bike and paddle board rental shop and a restaurant called Nani’s. The house is a 5-8 minute car ride to New Buffalo. There is plenty to do in the area with Red Arrow Highway lined with antique malls, home decor shops, restaurants and more. Spend a day at Warren Dunes State Park or stop at Greenbush Brewery for lunch and a beer. Come and enjoy this home in the heart of Union Pier and all that it has to offer! A perfect home away from home in Union Pier. Close to everything. Well appointed with a calming beach decor. The host made sure our group had everything we needed for a stress free get away. The home was clean and comfortable. Furnishings brand new. Will stay here again. Couldn’t be happier with our long weekend stay here. The house looks brand new and decorated with a warm beachy feel. It was also very clean. It’s also close by to the beach, casino and downtown area which are all a plus. I would definitely recommend this place to anyone and we will be staying here again in the near future. This house is super cute and comfortable. The perfect place to get away and relax. Bright and airy with beachy furnishings... I loved it. Kitchen has everything you need and is perfect size for gathering. While the house isn't over-size, it was more than enough for 10 of us to hang out comfortably. Great location - close to New Buffalo, beach, wineries with easy access to highway while still secluded for privacy. We walked to local joint next to a deli-style grocer. You won't be disappointed if you stay here. We stayed at Just Beachy for a girl's trip and it was just what we needed!! The fall colors were gorgeous and you have a great mix of nature, trees and privacy yet close proximetry to the Lake and things to do. We kept ourselves busy with a wine tour and shopping as well as a trip to the casino. At the end of the day it was a pleasure to come back to such a well appointed cottage oasis. I enjoyed the large soaking tub as well as the cozy fireplace. We sat on the enclosed back porch for morning coffee while watching deer in the backyard. It was a true getaway and we are already planning a return trip. 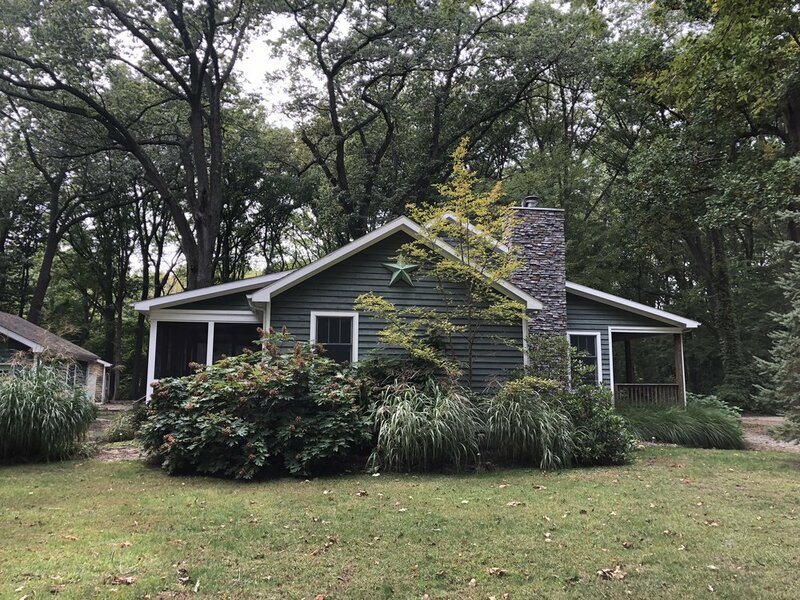 Beautiful clean cottage in pretty wooded area! Cottage was comfortable & clean with superb amenities. Comfortable living area & bedrooms. Bathrooms are great , one with a big tub for a soak after beach days! Kitchen is fully stocked with everything needed if you choose to cook instead of going out. If you do want to go out for meals, restaurants & pubs are only a few minutes drive away! Beautiful beach is is a quick walk-load up your wagon and go! Definitely will stay again!